Richard Beck is President of Classic Travel, a luxury travel website supported by a full service travel agency that has been operating in New York City since 1962. As well as enabling you to book hotels online, the website goes a step further and actually allows you to customize your room, letting you decide what type of pillows you want or how your minibar is to be stocked. They even save all of your preferences so that they know what you want for the next time you book. Rather neat, eh?! A typical day for me starts with a meeting with our Product Manager and Director of Marketing. The Product Manager is responsible for making sure that the content on the site is updated daily. The Director of Marketing is the liaison between the agency and the hotels and other vendors we support on the site. Reporting to them on a daily basis are the staff writers, graphic designers and programmers. Public relations and advertising, which we outsource, report to me weekly. My day then proceeds to meetings with my agents. I can never forget that we are a full service travel agency and that my agents are the ones who actually interact with the clients, and now more and more with our online clients. I like to call them the travel agents of the 21st Century. 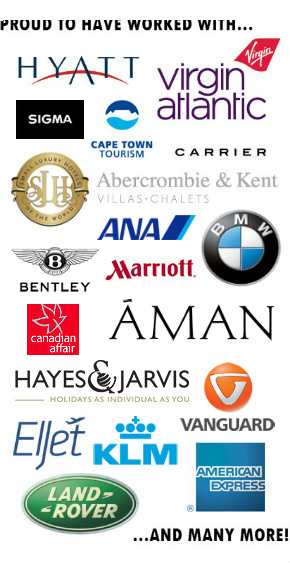 Hoteliers and tour operators from around the world visit our offices daily. We try to use that opportunity to make the best relationships we can possibly make so we can leverage them for our website users. I really like the challenge of translating my travel experience to the web. I also like being, ultimately the one who decides which hotels will be on the site. I admit it is a bit of an ego trip. There are so many fantastic hotels around the world but we must have only the finest represented in each destination as that is what sets us apart from other sites. I consider myself fortunate to have been to most places. However, what I still like most is the satisfaction I receive when a client is pleased. That is really what is representative of success to me. The website is enabling us to please more clients than ever before. 1. Being at the Copacabana Palace in Rio for the turn of the century certainly stands out. I’ve always had great feelings for the hotel and the annex suites are like having your own apartment in Rio, the most beautiful city in the world (geographically speaking). On New Year’s Eve the Copa has an extravagant ball, which is attended by many of the hotel guests and Rio’s elite. At midnight everyone congregates on the ballroom veranda to look below at Copacabana Beach where at least two million people dressed in white are reveling. Many of them are holding white roses, which they will toss into the surf as an offering to the goddess of the sea. At midnight when a really amazing firework display starts and night becomes day it all comes together in one giant climatic few minutes like nowhere else. I think that the Copa is still one of the best places to be for New Year’s. 2. When I was very young the first hotel I stayed in while in Paris was the Plaza Athenee. I never forgot it. I was very impressionable as it was my first trip to Europe. Everything about the hotel made my eyes open wider. The public areas have exquisite Baccarat chandeliers, priceless carpets and authentic period furnishings. The windows are framed by yards and yards of lush fabrics. I had not even been to the room yet but I knew I was in a Palace. The rooms facing the courtyard are my favorite. In the spring the sounds of birds chirping as you pull open the draperies to greet the new day is pure magic. Walking out the front door and seeing the Eiffel Tower is another feeling that makes your jaw drop. Life changes a little when you’re there. Very recently I was back and all these years later I got the same feeling. There are a few marvelous hotels in Paris but Plaza Athenee will always be the most Parisian to me. 3. This past December on my way home from a meeting in France I had to spend one night in Frankfurt. Rocco Forte Hotels are well known in the industry as being modern and luxurious. Their recently opened hotel in Frankfurt, Villa Kennedy, is a testament to this. The lobby almost has a feeling of being in a modern monastery. The ceilings are vaulted and high. It’s a striking hotel. However, the suite I stayed in for one night maybe one of the most well thought out and comfortable accommodations of any new hotel I have stayed at in years. There is not a detail missing. The lighting, which has dimmers, is perfect. The soundproofing exceptional. The entertainment system was thrilling. The bedding was the immaculate. The bathroom was large with heated floors, perfect water pressure and temperature that once set remained consistent. I was ready to crash but instead headed to the bar where I had the perfect Martini and a wonderful meal served by a staff that was attentive and caring. What’s so bad about being alone? I slept like a baby and the following morning went to their health club. I had a great workout and a perfect massage in their beautiful spa. On the way to the airport several hours later I thought (and still do) that my stay there had been a perfect 17 hours. Living in New York, I’ve had many but the one I keep thinking about was in Sydney last year. I had lunch with friends at Icebergs. It overlooks Bondi Beach. The setting is spectacular and believe me this is no ordinary beach restaurant. Sydney chefs are noted for their approach to cooking. Everything is beyond fresh and tastes are pure and clean. I have both through work and my travels. My favorite though will always be the time I was staying at La Semanna in St Maarten. I was by myself for two days before being joined by a friend. Each day I exchanged pleasantries on the beach with the nice man staying in the villa next to mine. When my friend arrived, and as we walked along their amazing beach, this nice neighbor passed and nodded a pleasant hello. When my friend asked if I knew who that was I just replied The man who is staying next door. My friend blew his cover. It was Harrison Ford. One thing that I really want to get more involved with, and that is becoming very popular in the travel industry, is taking all of your friends with you on vacation. I would love to round up my best friends and take over a Sea Dream cruise or a yacht of some sort. Perhaps we could cruise the Mediterranean. I haven’t figured out exactly where I want to go yet, but I think traveling in a group can be extremely fun.